With any franchise as enormously popular and financially lucrative as Harry Potter, it’s not surprising that Warner Bros. would return to the watering hole sooner or later even if the story of Harry and companions told over seven books and eight movies was concluded (though that didn’t stop author J.K. Rowling from tacking on a follow-up, Harry Potter and the Cursed Child) and now, with Rowling cutting out the middle man and directly penning the screenplay herself, we have returned to the wizarding world, not in a continuation or direct tie-in with the Harry Potter series, but in a stand-alone installment (albeit intended to serve as the start of a new film series) set in the same “universe”. 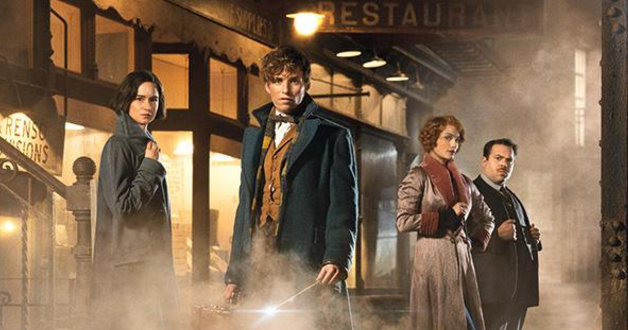 Fantastic Beasts and Where to Find Them, taking its unwieldy title and basic concept from one of Harry’s schoolbooks briefly-mentioned in the original series, is an enjoyable stand-alone adventure, but its status as a franchise-launching starting pad is more uncertain. Fantastic Beasts mixes things up by moving locations from contemporary Britain to 1920s New York City, where young British wizard Newt Scamander (Eddie Redmayne) steps off the boat carrying a briefcase containing a menagerie of “fantastic beasts”. Unfortunately, Newt’s journey to buy a gift for a friend and release a rescued creature back into the wild is derailed when a chance encounter with a roly-poly aspiring baker, Jacob Kowalski (Dan Fogler), leads to the two accidentally switching briefcases and several beasts getting loose and promptly beginning to wreak havoc on New York City. Meanwhile, there are larger issues at play in the background. Europe is being terrorized by dark wizard Gellert Grindelwald, whose destructive actions are threatening to expose the secret wizarding world and ignite a war between wizards and the “No-Maj” (“No-Magic”) populace (the American wizarding world’s term for ordinary humans with no magical abilities, better-known in the Harry Potter series as “Muggles”). This atmosphere of secrecy and tension gets the hapless Newt arrested by an investigator, Tina Goldstein (Katherine Waterston) and dragged before the Magical Congress of the United States of America, and its ominous Director of Magical Security, Percival Graves (Colin Farrell), but a series of events lead to Newt teaming up with Tina, her kittenish sister Queenie (Alison Sudol), and the bewildered Kowalski to round up his fantastic beasts before they expose the wizarding world. 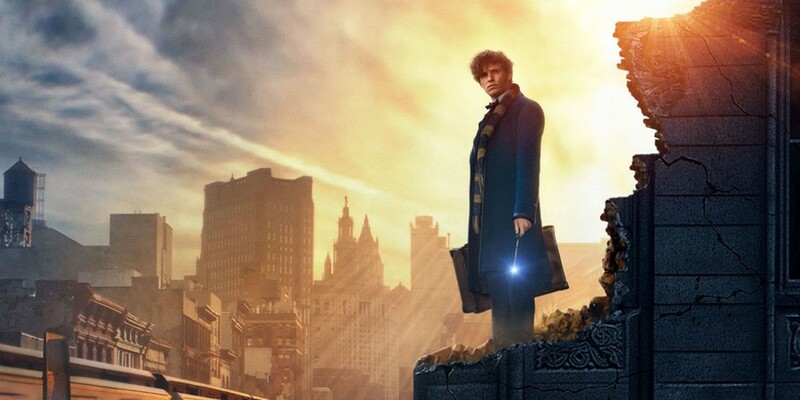 The best part of Fantastic Beasts is the main storyline dealing with the titular fantastic beasts, as Newt and company are led on a merry chase scurrying around New York, including visits to City Hall, Central Park Zoo, Macy’s Department Store, and the subway trying to get all kinds of exotic creatures back into Newt’s briefcase. There’s a huge rhino-like creature looking for a mate, a winged snake that can vastly grow or shrink in size, a griffin-like flying creature, and a mischievous possum-like creature that insatiably hoards anything shiny (the latter is sure to be a comically adorable scene-stealer), among others. The awkward Newt, all-business Tina, and bumbling Kowalski turn into an unlikely but likable team, with Rowling again following her basic template of forming mismatched characters into a team of fledgling heroes. The movie is on more uncertain territory when it tacks on “the big picture” to expand the film beyond its simple premise to lay the groundwork for the new franchise Rowling and Warner Bros. hope to be kick-starting (reportedly five films are already planned). Subplots involving the Magical Congress, the ambiguously-motivated security director Graves, the background specter of the offscreen “big bad” Grindelwald (who was mentioned in later chapters of the Harry Potter series, and appeared in cameos as a young man in a flashback of Dumbledore’s memories and as an old man in present day), and a group of anti-wizard zealots calling for a “Second Salem” and including the conflicted Credence (Ezra Miller), who may be a double agent for Graves, feel rushed and thinly-developed, mostly by virtue of being tacked on to expand the world beyond the simple and straightforward main story. Since it takes place approximately seventy years before the events of the Harry Potter series, familiarity with the previous books or movies is not a strict prerequisite for watching Fantastic Beasts, but there are various tie-ins, hooks, and callbacks that will mean more to Harry Potter fans (there are throwaway mentions of Hogwarts, Albus Dumbledore and the Lestrange family, and a couple house elves pop up). The return of director David Yates, who helmed the last four Harry Potter films, ensures a sense of continuity despite the change in period setting. The tone is fairly lighthearted and whimsical for the most part, especially in the semi-comedic antics of Newt and friends trying to corral the runaway fantastic beasts and Newt’s briefcase which, like Doctor Who‘s TARDIS, is bigger on the inside; a bewildered Kowalski’s journey inside the briefcase is one of the most visually wondrous sequences in the movie (in fact, Eddie Redmayne’s bowtie-sporting, frazzled Newt bears a passing resemblance to The Doctor), although the padded runtime ends up feeling a little overlong, and the climactic confrontation in the subway is a bit generic and underwhelming. Also visually impressive is the recreation of 1920s New York City, which is richly-rendered with impeccable attention to period details from the sets to wardrobes and fashion styles. The new characters are likable enough, though it’s too early to fairly measure how they stack up to Harry, Ron, and Hermione (although, considering the leads here are adults played by experienced actors, it’s unsurprising that the acting is more polished than when Daniel Radcliffe and company made their intro). Eddie Redmayne’s Newt, a socially awkward introvert who bonds easier with his creatures than with people (the way Redmayne plays Newt makes one wonder if he was going for autistic) is not a dynamic hero (nor, to be fair, is he intended to be), and his awkward mannerisms are initially slightly grating, but he soon becomes likable. Katherine Waterston provides a worthy foil/comrade as the no-nonsense Tina, who could be seen as the Hermione to his Harry (only plus obvious budding romantic undertones). Dan Fogler manages to provide a bumbling comic relief sidekick without becoming unbearably annoying, though his semi-romance with Alison Sudol’s Queenie is a tad unlikely. Colin Farrell’s Percival Graves, stalking around with a long black coat, broody glower, villainously slicked-back hair, and a name befitting a Bond villain, is an unsubtle “surprise bad guy”. There are small roles for Jon Voight (whose bit part seems rather pointless unless he’s returning in sequels), Samantha Morton, Carmen Ejogo (as the American Minister of Magic), and an unrecognizable Ron Perlman. The eleventh hour surprise cameo by SPOILER WARNING Johnny Depp’s Grindelwald (who is reportedly set to play a much larger role in following installments) doesn’t give us much to go on yet. Hopefully his Grindelwald will go the Black Mass route of Depp setting aside his usual campy shtick for something darker and more sinister, but his fleeting drop-in here isn’t enough to say. It’s a little up in the air at this point how successful this “new” franchise will be at reigniting Harry Potter mania. Those with a love for the original series are likely to be the most drawn to this chance to return to J.K. Rowling’s wizarding world, though at the same time they might not take to our new cast of characters in place of Harry, Ron, and Hermione. It’s easy to be cynical about the prospect of five films in the Harry Potter world not featuring Harry Potter and accuse Rowling and Warner Bros. of overdoing it to milk the franchise to the last drop. But in any case, Fantastic Beasts is at least an enjoyable stand-alone fantasy romp, even if its position as franchise-launcher is more uncertain.